Well, the playlist is on the long side this edition, with well over an hour and a half runtime. I guess it was difficult trying to cut things down this time. There are some big new releases coming out right now. Just released Death Cab For Cutie, Fliptrix, and Cullen Omori, as well as some more releases right on the horizon like IDLES’ Joy As An Act Of Resistance coming out on Friday. I’m excited for Eliza Shaddad’s debut full-length that is set for October. Shaddad has released a couple EP’s in the last few years, and there are a handful of singles available from the upcoming release. I was only recently made aware of her material, and she’s certainly a young artist to get excited about. I’ve especially enjoyed this track that I’ve included in this edition, “This Is My Cue”. Moses Sumney is following up last year’s debut full-length, Aromanticism, with some of the most poignant songs to be released this year. It’s only 3 tracks, but I would put them right in with the best music of the year. I have to think that he’ll continue to reward his audience with excellent music for a long time to come. I highly recommend giving this new material, Black In Deep Red 2014, a listen. For me, it makes him one of my top artists to watch. Whatever comes next from him will be a huge. Starting with “Rank & File” by Sumney, this playlist goes into a short back-and-forth between UK Hip-hop and US Hip-hop. I could discuss for a long time the strengths, similarities, differences, and the influences between them, but it’s probably better to just let the music speak for itself. My point here is to display the diverse strengths in hip-hop right now. There’s so much life in Hip-hop right now. Particularly, I want to highlight Fliptrix. Now to talk about Fliptrix, then you need to talk aobut High Focus Records. Fliptrix is also the CEO of the label, and has been instrumental in the careers of High Focus artists including several that I’ve included on this blog in the past. It’s well worth digging into Fliptrix’ full catalog including two full-lengths as one quarter of the group The Four Owls along with fellow High Focus artists, Verb T, Leaf Dog, and BVA. His new record, Inexhale, is an excellent, lyric-forward listen. Other favorites this edition are BODEGA, Ben Khan, The Chamanas, WHY? and Dirty Projectors. Well, it’s the late edition, isn’t it? There’s less than an hour left in August 12th. It has been a weekend full of great music thanks to the big SubPop 30th Anniversary party. I had the pleasure of seeing Yuno and The Afghan Whigs on Friday night, and on Saturday I got to see LVL UP, Moaning, Kyle Craft, Loma, Bully, Clipping, Fastbacks, Shabazz Palaces, Wolf Parade, and Beach House. I’ve included new material from a few of these, as well as some of the acts I missed. There’s a lot of great artists to highlight, and it’s sometimes difficult to decide who to write a little extra about. It was easy to decide that Candi Staton should be highlighted. At 78 yrs old, Candi Staton is set to release her 30th studio album. Just let that sink in a bit, and then listen to this song I’ve included this edition. Her voice hasn’t lost an ounce of its power, and she’s an absolute inspiration. I’m always excited to get new Black Joe Lewis & The Honeybears tunes, and the 3 singles he’s released recently are no exception. Their blend of blues and rock with swagger is always tons of fun, and they play a simply awesome live show. It’s been less than 2 yrs since his last record, so a new record and a big fall tour is exciting news. Other favorites… still really loving this Marlowe album, enjoying these new singles from Mudhoney, Revel in Dimes, Metric and LVL UP. This week is a massive celebration of the Seattle music-scene. It’s actually a dual celebration. Basically, this is music insanity week in Seattle. Celebration 1: Pearl Jam Home Shows. When Pearl Jam announced their tour this year they branded it as a sports team would… Home and Away shows. Sorry if you were expecting “Home Show” to feature a new furniture line (upholstered with old flannel shirts, of course). The Home Shows have some particularly special aspects to them. As part of their announcement, the band announced their intention to address the out-of-control homelessness in Seattle. The region’s homeless population is now 3rd largest in the country, with over 12,000 people living without shelter on any given night. In addition to spotlightling over 100 non-profits working locally, the band is giving generously of their own money and working with local businesses for promotion (as I write this, I’m sipping a Pearl Jam Home Show pale ale made by Georgetown Brewery). The two Home Shows (August 8th and 10th) at Safeco Field sold out in minutes. On August 8th, over 70 Seattle restaurants will be donating percentages of their sales. For more information on the mission of The Home Shows, you can find places to donate and volunteer HERE. What Pearl Jam have done here is not just see what the band and their fans could do to alleviate homelessness, but they’ve managed to gather over 100 local businesses to join in this cause. 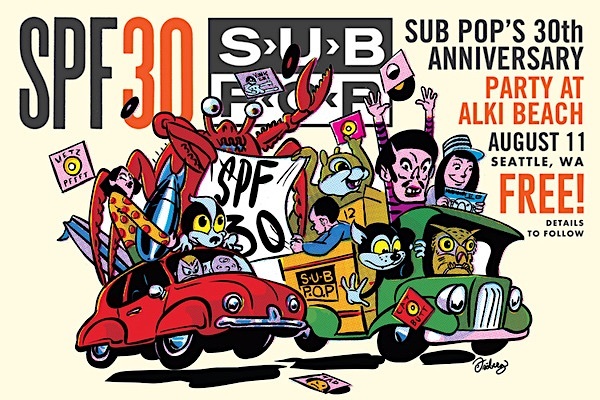 Celebration 2: SubPop’s 30th Anniversary. If there’s a label that could most distinctly be connected to the Seattle scene and sound, then it is SubPop. They found success by introducing the world to now household names like Soundgarden and Nirvana, but, of course, the story has more twists and turns than that. The first “grunge” album to be released was Green River’s debut EP Dry as a Bone, but the band, meant to be SubPop’s main act, broke up not long after. The good news was one of the two bands to come out of Green River, called Mudhoney, would sign with SubPop (The other band would eventually become a band that would sell out two shows at Safeco Field this week as part of a massive benefit to alleviate homelessness). Mudhoney’s first single was a hit on the Indie circuit, and that was enough to keep the label going after being nearly bankrupt. Mudhoney will be among the bands playing this weekend at the free anniversary party at Alki Beach along with many others performing over the course of the weekend. I’ll be in the city for the weekend hitting the SubPop showcase edition of KEXP’s Concerts at the Mural in Seattle center on Friday, and I’ll be volunteering at the SubPop anniversary party on Saturday. Check out the full event schedule HERE. With all this happening this week, I decided to put together a little playlist including Pearl Jam and something from the bands playing the SubPop events. There’s some muddy guitar sounds coming at you on this one. Wolf Parade – What Did My Lover Say?